First, make a list of everything you grew last season. Highlight the varieties that did well, and mark those for reordering. In the unlikely event that one of your varieties is missing from the catalog, start reading descriptions to see if anything is named as a replacement. If you don't see any mention of your star variety, give us a call. If seed is available, your sales rep can special order it for you. If there was a crop failure, however, and it's just not possible to get seed, you'll have to look for a replacement variety. Next, think about the crops that didn't do well for you last season. Analyze the problems you had with each disease, low yield, too quick to bolt, sun scald on the fruits, and so on. Go back to the catalog and read descriptions carefully to find varieties with traits that may address your problem. Johnny's catalog descriptions use objective criteria to help you understand the differences among varieties, but if you are unsure about anything, call us. Pick at least two varieties to test. At this point, you are well-positioned to repeat your successes and overcome your failures from the past. Now you can think about adding some new crops, whether they are new in the catalog or just new to you. We recommend that you make a cup of tea, find a comfortable chair, and start reading the catalog from start to finish. If a variety description appeals to you or stimulates marketing ideas, check it off for further consideration. Look at those identified as "NEW!" to see if you want to give them a try. If you're like most growers, your wish list will be bigger than your garden and you will have to refine your selections. Check out a few forums online to see what other growers have said about varieties you are considering. Cornell University has an online vegetable variety-rating project with more than 5,000 varieties listed. Growers from all parts of the country contribute to the project, so you may find information about varieties that do well in your area. If a crop is completely new to you, find out if your state Cooperative Extension Service has any recommendations on varieties. Check with other states in your region, too. Varieties that have been tested and performed well, even if they are not the newest varieties, provide a good starting point and can be used as a basis for comparison. Think about extending your season with hoophouses and row covers in winter or shade cloth in summer. Look for special symbols in the catalog that denote cold tolerance, heat tolerance, and greenhouse production. You will be more successful at season extension if you choose the right varieties. Set up variety trials so that they produce useful data. 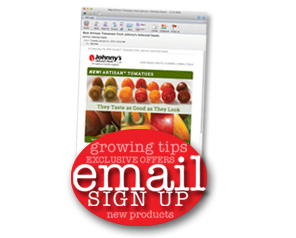 See the Johnny's website for information on how to conduct a variety trial. Finally, keep good records. Record information about planting dates, harvest dates, yield, insect and disease problems, appearance, and market acceptance. Next year, when it's time to start variety selection again, those records will make your work much easier. Figure out how much you want to grow of each crop, based on your market expectations and past experience. Then calculate how many plants you need to produce that quantity and how much space you need for that number of plants. Johnny's has several resources to expedite these calculations, such as the yield chart in the catalog and a new seed calculator online. Crop rotations over time are extremely important in vegetable production success. Rotating crops breaks up insect, weed, and disease cycles and helps to balance nutrients across the farm. The first element of crop rotation should be based on the botanical families of your crops. Don't grow plants in the same family on the same piece of land for at least three years; four or five years is better. Ideally, crops can be rotated through your management units, so the best system is to have four or five units for a long rotation. Group crops by production practices such as cultivation practices, row covering, days to maturity, lines of drip tape needed, nutrient and water demand, and pest control. Keeping crops with similar requirements together will expedite tasks and give the field a neater appearance later in the season. For example, it might be quickest to plant lettuce and onions in the same bed because they can be planted at the same time in spring. But lettuce will be harvested within 45 days, whereas storage onions might be in the field for 100 days or more. The bed for the onions will need to be weeded and watered long after the lettuce is gone. Try to group crops that are planted and harvested at approximately the same time. Locate crops according to harvest requirements. Some crops such as watermelons and sweet corn are so heavy you'll need a tractor or vehicle to move them out of the field. Others such as salad mix can be carried in a tub. Think about these and other access issues in planning your fields. With all these nuances in mind, you can start mapping. Some growers use spreadsheets. Others use index cards, with one crop on each card. Others map out the next season on graph paper, then cut the units apart and reassemble them for the following season. However you do it, it takes considerable skill and vision to create a multiyear planting plan. But once accomplished, your plan will be a tremendous asset to your farm. A winter vegetable basket. Set aside onions, garlic, carrots, sweet potatoes, and winter squash as you harvest them, and assemble mixtures into brand-new baskets. Tuck in a few of your favorite recipes for inspiration. Garlic braids. Grow more than enough garlic for your markets, and be sure to cure the bulbs sufficiently to provide the best shelf life. Softneck varieties are easiest to braid. Weave in some bunches of fresh herbs, and tie on a raffia bow. Herbal vinegars are pretty as well as useful. Here's a detailed instruction sheet on making herb vinegars. Hot pepper jellies require time at the stove, but their jewel-like colors make them perfect gifts. Attach a tag suggesting an easy appetizer of cream cheese smothered with hot pepper jelly, served with thin slices of bread or crackers. Herb mixes. Dry culinary herbs thoroughly, then crush them with a rolling pin between sheets of wax paper. Mixtures of herbs can be used in all kinds of products. You can put them in small cellophane or plastic bags (check in the candy-making section of hobby stores for supplies) and staple them closed with a tag suggesting the herbs as a rub for chicken or fish, a dip mix, or to sprinkle over roasting vegetables. Add them to dried beans for a soup mix. Or mix up the dry ingredients for biscuits, attach a recipe for herb biscuits, and decorate the package with a biscuit cutter. Herb salts and sugars. Wash fresh herbs such as sage, thyme, rosemary, and basil, and dry completely on a towel. Put a 1-inch layer of kosher salt or sea salt in an airtight container, and then make several layers of salts and herbs. The salt will absorb the flavors of the herbs, and can be packaged into small, decorative jars for gift-giving. Sugar can be used the same way, though you might want to use herbs such as lavender, mint, and lemon balm, and attach a scone or sugar cookie recipe. As your outside work winds down, you may want to spend some time learning about a new growing practice, investigating a new crop, or just catching up on what's new in the world of market gardening. We invite you to visit Johnny's website and explore the videos, articles, and technical sheets that are waiting for you. 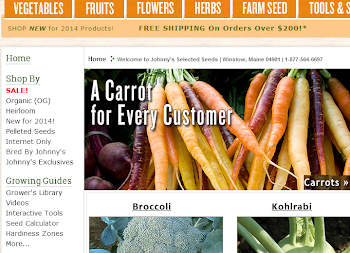 Go to johnnyseeds.com and follow the links to the video library for short videos of the tools and techniques we use at the JSS research farm. For technical information sheets, go to a product detail and click on the "More Product Information" tab for a list of related resources. Market growers may soon be affected by federal food safety legislation and regulation. Some wholesale buyers are already requiring food safety certification for vendors. These are issues that could change the way you farm and market your produce. Growing for Market, the magazine for market farmers, is following food safety issues closely and publishing regular updates on its website. Sorry for the delay in getting back to you, Paul. We use several different brands and types of tillers here. I'll try to get you some more information and recommendations. Three acres is a lot of tilling; I think I’d look into a tractor powered one before I’d look at anything else. If Paul is indeed looking for a tractor powered one I would suggest a Howard. We’re on our second one and we’ve pounded a lot of ledge and rocks with ours. They are dependable and I wouldn’t hesitate to attack a twenty acre field with one. On the other hand I’ve seen some Countylne tillers from Tractor Supply that look every bit as rugged as a Howard. I don’t know much about them; I’d want to check on parts availability and prices before I bought one, but they appear to be every bit a rugged as a Howard at considerably less cost. Two farmers I know have them and are happy with them. For a walk behind tiller: we’ve been looking into replacing our Troybilt Horse as it’s getting worn out. Troybilt has been bought out by MTD and their quality is shoddy at best. They’re also expensive for what they are. We’ve been looking at a BCS but they to are expensive; to get a machine to do what we want to do will cost us over ten grand – a lot for a tiller – too much in my opinion. A tiller that costs as much as a new small tractor – I think not. There’s a brand called Goldoni sold by OESCO of Conway, Ma. but I don’t think they’re going to be any less expensive than a BCS. We could buy a large homeowner type tiller and use it for a couple of years then trade it in, but a tiller like this won’t last here on the farm where it’s not uncommon to use it for 6-8 hours a day straight. Not many tillers can handle that much steady use; certainly not “homeowner” types – ones that get used only occasionally. Resale value is little if anything. There really isn’t much out there for small commercial growers like you and I. For what it would cost to buy a good tiller that’s going to last, we can buy a new, small tractor with the attachments that we need – like a Tuff Bilt. That’s what I’m leaning to right now.